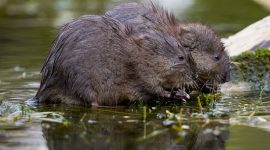 Muskrat Love! 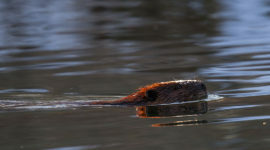 A pair of muskrats dine together in the waters of Snug Harbour. 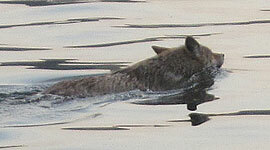 A muskrat munches on a tasty morsel in the waters of Snug harbour. 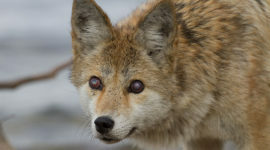 A nearly blind coyote wanders the First St beach, and then swims a circuit of the Cove before disappearing towards the Eastern Gap. 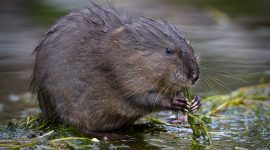 Thanks to Michelle for the tip. 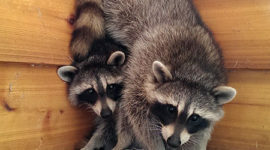 Juvenile raccoons act like Jenga pieces after being rudely awakened from a summer snooze. 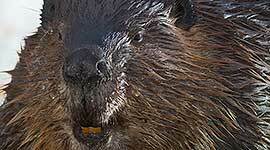 Snow dusts the face of a beaver after a freak spring snow squall. 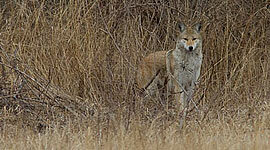 A Coyote blends into the background colours of early spring, in the Parks yard by the filtration plant. 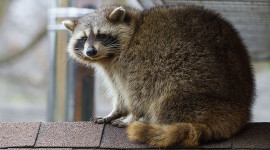 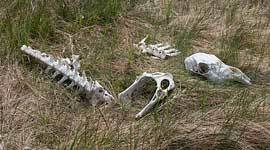 Racoons are back on Third St., the little bandits running roughshod over the rooftops at night. 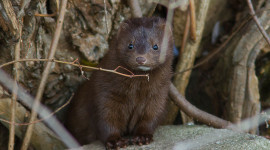 A curious mink perches on a rock by the old fire hall. 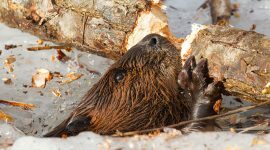 A large beaver rests on the ice near the RCYC, feeding on branches close to holes kept open in the thick lagoon ice. 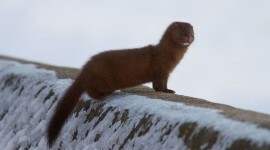 A mink pauses on the boardwalk breakwall, before heading into the pack ice between the Island and the Spit. 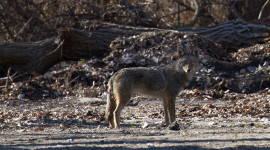 A member of the Parks staff, arriving at work at 6:44AM, caught this coyote swimming from Hanlan’s Point to the IYC. 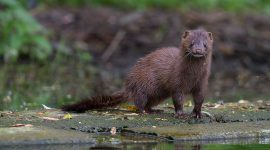 Photos by Kathy Gallagher: Click images to view larger. 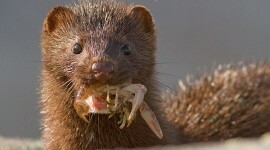 A mink pauses momentarily on its way to dinner with a delectable crayfish, which it will consume entirely except for the legs. 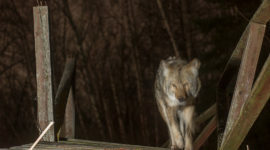 A wild coyote strikes a pose in the late November twilight near Centre Island. 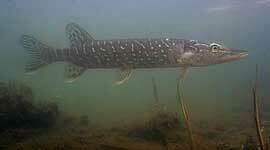 A day in the life of an underwater camera as a young northern pike, muskrat, and painted turtle cruise past in the lagoon’s murky depths. 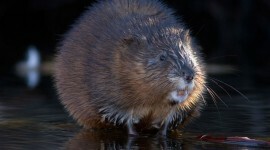 A muskrat, looking for all the world like a small mountain of fur, sits in the waters off of Doughnut Island. 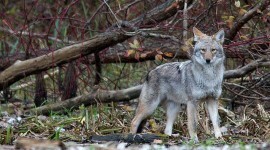 A coyote, blending in perfectly with the browns of early Spring, stares down the camera by the filtration plant. 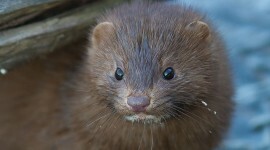 A mink, whiskers sporting ice in the -11°C air, surveys its surroundings on fresh ice formed by a sudden March cold snap. 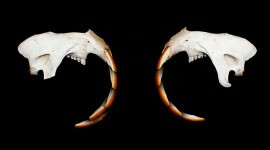 So, just how long are a beaver’s front teeth? 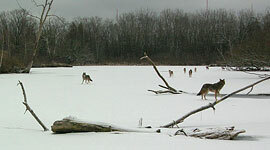 Almost six inches, as it turns out. 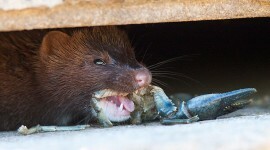 In our continuing series of Wildlife Sticking Their Tongues Out, a Centre Island mink crunches through a crayfish, consuming it entirely shell and all.